Doesn’t look like much, does it? But this is an historic hardwood, a pertinent plank, a great grain. 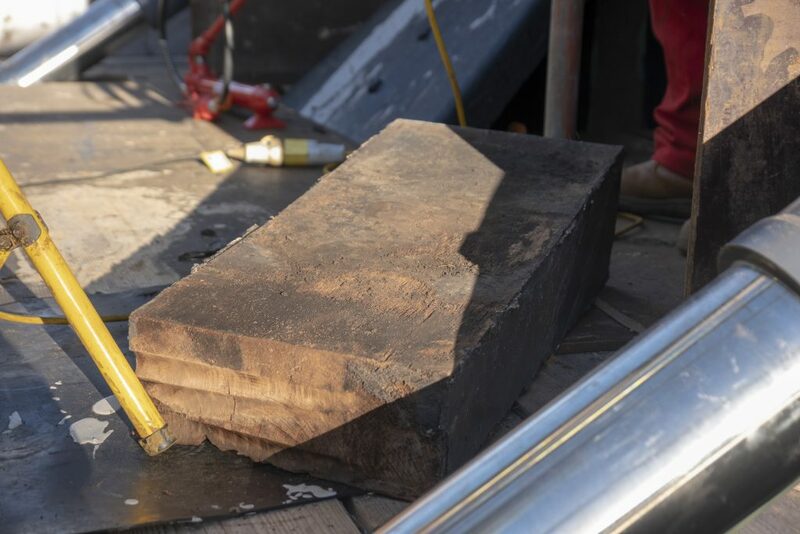 Because this is the first block- from a total of 44 – to be released from its 100-year old (near enough) home between cradle Number 5, on the starboard side of HMS ‘Victory’s hull, and the ship herself; placed there in the 1920’s as a buffer between ship and cradle, to protect the mighty ship’s hull from the steely embrace of its huge black supports. And it’s historic because it means this is Day 1 of fully re-supporting Nelson’s flagship on an array of hydraulic, adjustable props, running in two lines along both sides of the ship. For the first time, after months and months of exhaustive testing, those wonderful pieces of engineering are taking the weight and -‘Victory’ into her future.